Unlike modern regiments, or even Napoleonic ones, each company in a regiment had a colour. As a standard, regiments comprised a Colonelle’s, a Lieutenant-Colonelle’s, a Major’s, and First through to Sixth Captaine’s companies colours, a total of nine colours. 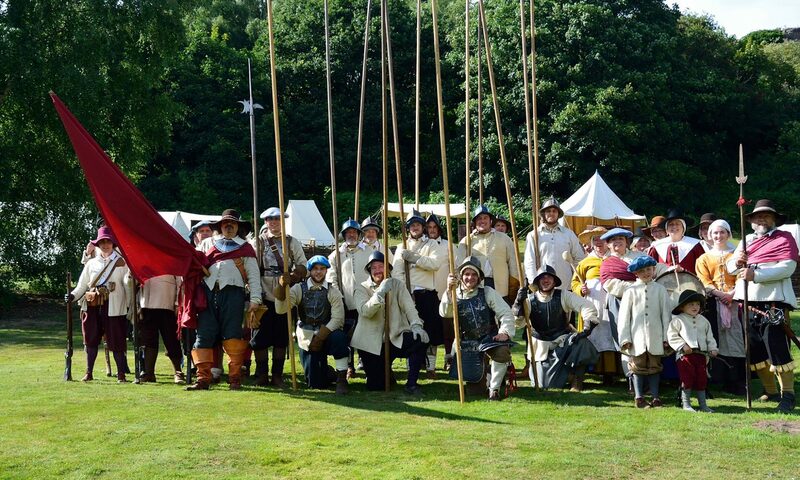 To deal with the last point first, we see examples of unique systems on our battlefields in the colours carried by King’s Guard, Rupert’s Foote andTower Hamlet’s Auxilliaries regiments. Even with these, the principle that you can tell the specific company by the colour carried remains. Kings Guard (left) and Rupert’s (right) colours. the Venn system. In a feature common to all systems, the plainer the colour the more senior the company to which it belongs. So the Colonelle’s company carries a plain colour with no decoration at all. As our Commanding Officer Dave holds the rank of Colonelle, the colours we carry at the moment are those of a Colonelle’s company. At this point it is worth pointing out that the size of all colours was the same, namely six foot six inches square. As the seniority of the company declined the busier the colour became. So the Lieutenant-Colonelle’s colour had a simple St. George’s cross in the top corner against the pole. pile wavy coming from the bottom corner of the St. George’s Cross towards the centre of the colour. Instead of the pile wavy, the First Captaine’s colour would have a single device as its distinguishing feature, the Second Captaine’s two and so on. The distinguishing feature could be something as simple as a ball or as we have used a cross. It might also be based on something from the Colonelle’s coat of arms, or have some other reference, such as the dog recorded by Symonds on Colonelle Talbot’s regimente’s colours at the Aldbourne Chase muster in April 1644. Whatever the device used it is replicated across all the Captaine’s colours. One thing that was frowned upon was the use of full coat of arms on colours, although there are a very few instances of this happening. There were some variations on this theme. Instead of the Major using the pile wavy, they sometimes used the first device, which meant the First Captaine then had 2 through to the Sixth Captaine’s having seven. Another alternative was to simply add to the pile wavys, the First Captaine having two and so on. The other main system used was called Gyronny. nally using two different colours as per the photo above. Other Captaine’s colours further subdivide the field, but still use the same colours. A range of Parliamentary colours showing various designs of the Venn system. We hope you enjoyed this crash course in Civil War colours and hope to provide more interesting articles such as this over the winter.